Teaching From The Vajrasattva Retreat is the transcripts of Lama Zopa Rinpoche’s teachings at a three-month Vajrasattva retreat held at Land of Medicine Buddha, California, in 1999. The retreat was led by Venerable Marcel Bertels. About 125 people participated, seventy five of them full time, including twenty nuns and monks. In addition, Rinpoche offered weekend public talks, which were attended by many people from outside of the retreat. The Vajrasattva initiation on February 6 and the long life puja and Amitabha initiation on April 30 were attended by about 250 people. The text has been divided into four seperate PDF-files. They are about 200 pages each. These books are republished here on holybooks.com with the kind permission from the Lama Yeshe Wisdom Archive. In the following weeks we will publish more of their works. 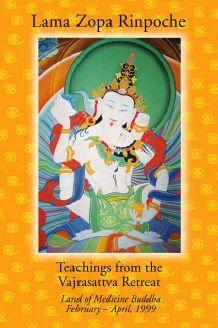 The Lama Yeshe Wisdom Archive is the collected works of Lama Thubten Yeshe and Kyabje Lama Thubten Zopa Rinpoche. The Archive was founded in 1996 by Lama Zopa Rinpoche, its spiritual director, to make available in various ways the teachings it contains. Publication of books of edited teachings for free distribution is one of the ways. Lama Yeshe and Lama Zopa Rinpoche began teaching at Kopan Monastery, Nepal, in 1970. Since then, their teachings have been recorded and transcribed.